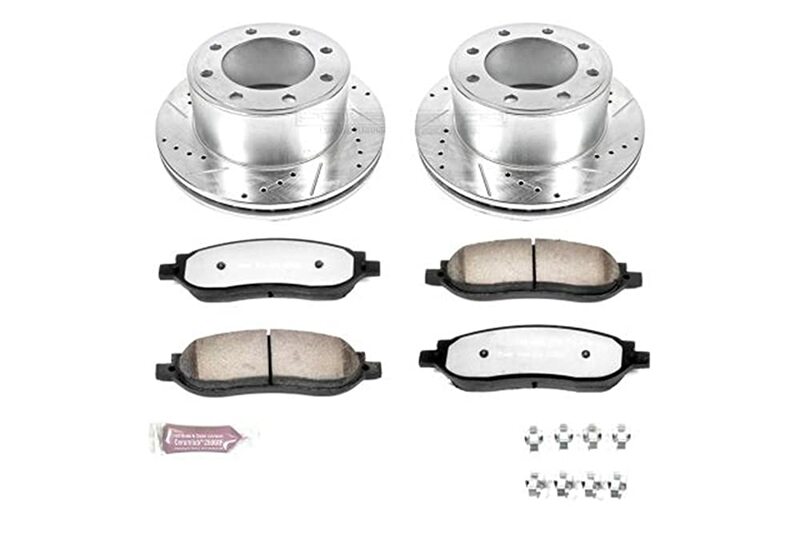 Best Brake Pads for F250 Super Duty Reviews: Top 5 in April 2019! Best Brake Pads for F250 Super Duty – Buyer’s Guide! Just for your information, brake pads are application focused; this means that brake pads for driving are not the same as for hauling or racing. If you intend to upgrade your vehicle, you have to consider the main use it will perform. There is no “best” all-round brake pad, there is a “best” for each specific application, as such, if you intend to use the same vehicle for multiple applications, consider the percentage of use and attach the ones you will most use. Here are the 10 best brake pads for different applications for the F250 Super Duty Ford. This is the Power Stop®. 1-Click Z23 Evolution Sports Drilled and Slotted Front Brake Kit without Calipers model #K1796. This is a ceramic brake pad unit that is fabricated with a rotor run out within 0.0015 and DTV tolerance specification is within 0.005 making this a mill balanced rotor unit. The rounded slots sweep away water, gas, and dust to keep a clear contact patch between the pad and the rotor. There are beveled; precision drilled holes that maintain lower rotor temperatures during extreme braking conditions. The components are all silver zinc plated after being drilled and slotted; this shields the parts to resist rust during standard operations. The rotors are cross-drilled and slotted for efficient cooling during heavy use. All the components are OEM sized and shaped, making this a perfect fit for any application. The pads are made of a Carbon Fiber infused Evolution ceramic formula, and the surface is thermally scorched, this is known to deliver an optimized and maximized stopping performance. To make this a noise-free braking experience, the pad is chamfered and slotted like the OE pad. The backing plate is powder coated making this extremely corrosion resistant. Add to this the rubberized shims, and you end up with one of the quietest braking solutions on the market. This kit comes with a comprehensive stainless-steel hardware kit for effortless installation, and the system used a specially formulated ceramic-based lubricant. The EBC® Stage 20 Street Plain Front and Rear Brake Kit #S20K1048 is another fine example of exceptional engineering. 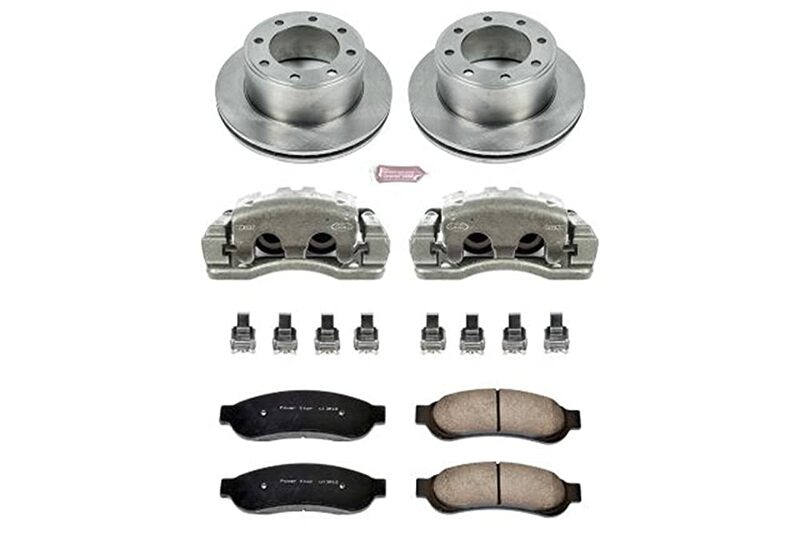 This kit is sized and shaped to OEM specifications and comes with the tightest tolerances, and is designed to meet and lower OE levels of heat buildup, brake noise, vibration, and wear. This model comes with a protective finish that provides corrosion protection over all non-contact areas and has many applications include high-performance street driving, drifting, the short track runs, truck or SUV use, and normal street driving. The EBC Stage 20 is a high quality “gray” iron with a higher carbon content that reduces brake shudder, heat cracking, and high-frequency vibrations. Essentially it eliminates squealing. The vented center allows effective cooling by passing air between both rotor sides, and the patented AF42/66 pad friction material has a very low metallic content which leads to a 50% reduction in rotor wear. The center gap provides the brake pads with proper heat expansion. The backing plate and side edges of the brake pad are coated with a black powder coating that gives added resistance to corrosion. The unit combines a nose-reducing shim, together with chamfered edges on the pad surfaces that reduce rotor lip contact negating squealing after much use. This model produces low levels of brake dust, and EBC recommends an initial 500-mile break-in period. The whole kit is covered with a patented Brake-In™ red top coating that both scours off existing glaze or heat spots and provides a better grip during the first 100 miles. The Power Stop® 1-Click Autospecialty OE Replacement Plain Rear Brake Kit with Calipers #KCOE1799 is another perfect after-market upgrade that greatly improves your performance and safety. 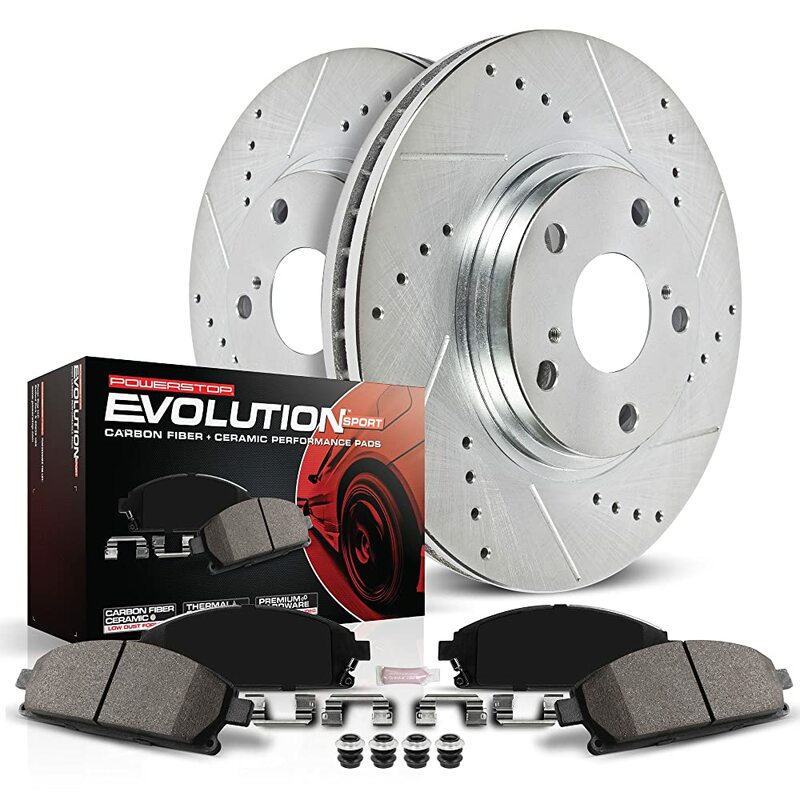 This kit comes with a full set of OE replacement rotor combined with high-performance Z16 Evolution ceramic pads. 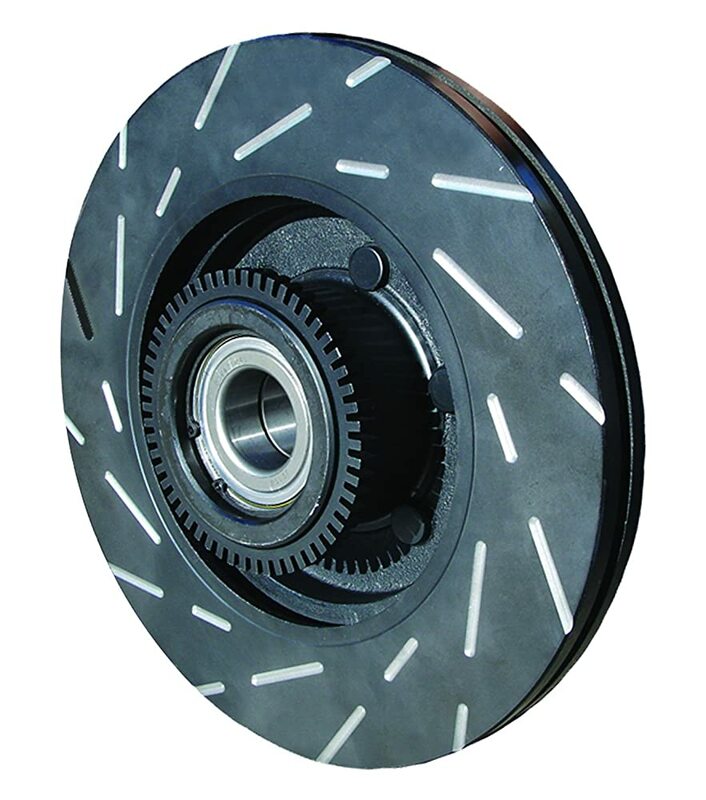 These pads provide a higher coefficient of friction than OE, and the low dust ceramic formula provides superior braking power with cleaner wheels. The backing plate is powder coated and is a long-lasting corrosion resistant component that extends the over the life of this unit. #KCOE1799 comes with noise insulating rubberized shims and chamfered and slotted like OE pad, combined these parts deliver you with noiseless braking performance. The Power Stop® 1-Click Extreme Z36 Truck and Tow Drilled and Slotted Rear Brake Kit without Calipers #K1799-36) kit is designed for heavy-duty use. This is the tank model, one that you want for your weighty and heavy loads. The rotors are precision machined using a Tru-Cast™ technology with a 0.0015 rotor runout precision and a 0.005 DTV tolerance specification, making this rotor mill balanced. The beveled precision drill holes are engineered to reduce rotor temperature, especially when under extreme braking conditions. The rounded slots maintain a clear contact patch that separates the pad and the roto; it cleans away all particulates. The slotted and drilled roto parts are silver zinc plated resisting corrosion while under normal performance, and the carbon Fiber infused Evolution ceramic formula delivers an optimized and maximum braking solution. This model is slotted and chamfered like the OE pad, and together with the powder coated backing plate delivers a silent and long-lasting performance. The kit is made to install immediately and comes with a full complement of steel anti-squeal shims. This is a towing and hauling application kit. 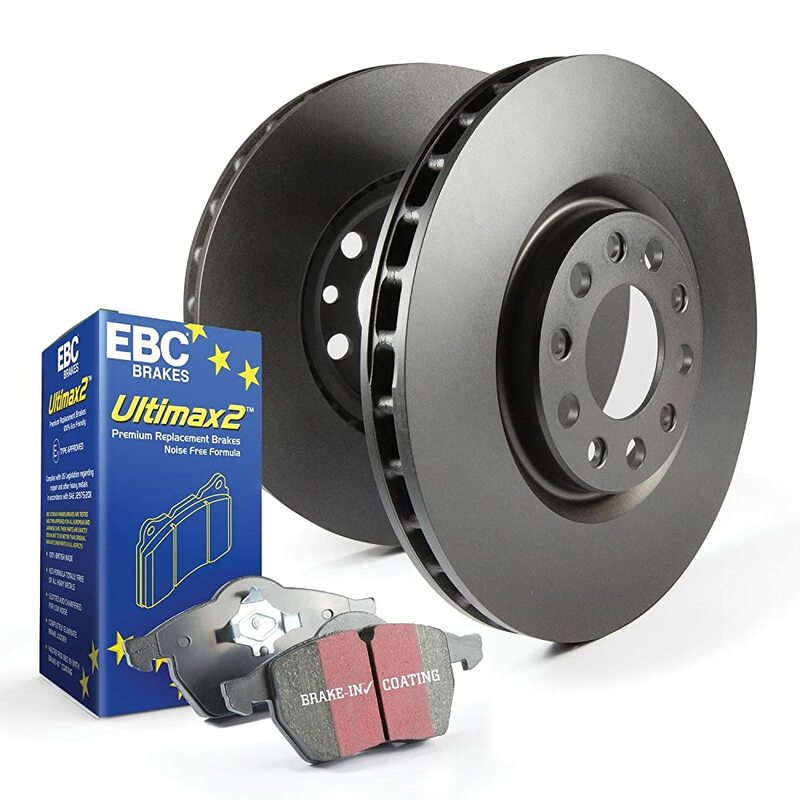 The EBC®USR BlackDash Series Sports Slotted Vented 1-Piece Front Brake Rotors #USR7321 is a multipurpose application brake pad kit. This model comes with a multiple slots in a narrow, heavily angled pattern that provides a cooler and quieter running surface. The vented center spreads an even temperature with moderation to avoid warpage. The kit is coated with a protective finish to reduce corrosion and resist rust in non-contact areas. This model was engineered to be the quietest of all brake pad kits, and to deliver a silent performance. EBC recommends this kits compatibility with Greenstuff, Yellowstuff, and Redstuff pads. Their rotor surface has two sets of slots which creates even pad wear, and the angled slots provide an optimized heat, water, dust and gas expulsion environment. The rotor is unidirectional and is positioned on both the left and right as such. This maximizes their effectivity in all road conditions. The coating is a powerful Black GEOMET™ and NITROTHERM™ anti-corrosive finish.